The 2007 updated Version of the Ashton Manual. This manual contains important new information to patients and doctors about the need for patients to control their own taper. It contains detailed suggestions on how to withdraw after long-term use as well as individual tapering schedules for different benzodiazepines. Withdrawal symptoms, acute and protracted, are described along with an explanation of why they may occur and how to cope with them. Free download of the Table of Contents available. "The Accidental Addict will be a great resource sitting beside a person who suspects that they may be being made ill by the tranquilizers or sleeping pills that they have been taking. This is a "must have" book for anyone considering coming off their sleeping pills or tranquilizers or in the process of coming off." Ross, United Kingdom. "The Accidental Addict by Di Porritt and Di Russell provides an up close and personal account of the effect of addiction to benzodiazepines. Their book is based on hundreds of in-depth conversations with benzo sufferers just like you." 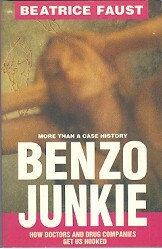 "Benzo Junkie: More Than a Case History" was written in 1993 by Beatrice Faust. The subtitle, "How Doctors and Drug Companies Get Us Hooked" is the primary theme of this book. Ms. Faust told the truth about the less than truthful history of the pharmaceutical companies about the same time Dr. Peter Breggin wrote his book, "Toxic Psychiatry." Both of these books should have shocked the world with what had been, and continues to be, the crimes committed by the pharmaceutical industry, but unfortunately, money and politics talk. Because this book so completely covers the shocking truth about pharmaceutical companies, and does the most superb job of it I have ever seen; I hate to say Ms. Faust's struggle with benzodiazepine withdrawal is the best part of the book, but it is certainly one of the best parts. Faust is a rare individual, upfront as a person can be, refreshingly unique, and shockingly truthful. The only problem with this book is that it covers so many topics so well that no one review can begin to cover it well enough. "Alive and Kicking - the true benzo story of Peter Ritson, the co-founder and ex-chairman of CITA (Council for Involuntary Tranquilliser Addiction). Discover the secrets of one man's journery from benzo withdrawal. 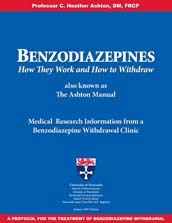 This is a must read for anyone planning to withdraw from benzos." "The Judas Window is a story about the devastating consequences of prescription drug abuse - a story of enormous significance to the thousands of people everywhere who have been drawn into a descending cycle of drugs, depression and ruin, and to the many more thousands who have suffered in observing that descent. The Judas Window will also speak volumes to anyone concerned about the frightening power of the prescription drug industry, an industry that effectively manipulates both doctors and patients in pursuing its billion dollar gains." Valium, Librium, Mogadon: These are just some of the brand names of drugs in the benzodiazepine group which today pose a horrifying addiction problem for many ordinary people. Although they are widely prescribed by doctors, these drugs are not only highly addictive, but they can cause brain damage, mental confusion and anxiety itself - which is the very symptoms for which the drugs are most commonly prescribed. 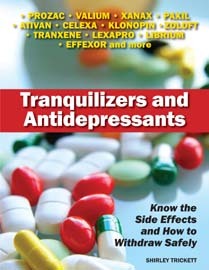 Life Without Tranquillisers gives you the harsh facts about the dangers of these "happy pills" and being hooked on them. There are wise guidelines on how to relax and how to overcome the stresses of modern life without turing to pills for help. Most important of all, Dr. Coleman clearly explains exactly what action you should take so you can safely cut down on and then stop your drug intake. "This is my story. I hope that by reading it other long-term tranquilliser users will be helped to understand their problems and be encouraged that there really is a light at the end of the tunnel." Xanax Withdrawal provides a road map for stopping Xanax. Xanax dependency is a common problem, and there is little practical information available on how to safely and comfortably stop taking it. A patient can unknowingly become dependent on Xanax, with dependency sometimes happening after as little as a week or two of regular use. Dr. Shipko addresses issues related to stopping Xanax; why to stop, when to stop, how to taper the drug and what to expect during withdrawal. A practicing psychiatrist for over 34 years, Dr. Shipko has had considerable experience with Xanax because of his subspecialty interest in panic disorder. "The Benzo Book" by Jack Hobson-Dupont. Download the full text in .pdf format. "Colin went into a life on hold at the age of 25 when he became an iatrogenic victim of tranquillizers and many other consequent mind drugs. He came out of that chill at the age of 55 through personal discovery. So much for medical expertise in the use of drugs which he discovered were only supposed to be prescribed for a month at most including withdrawal. He became a Primary teacher in 1972 and did Art as a main course. This followed years as a civil servant, local government officer, bus conductor and many temporary jobs. That lasted until he was 38 in 1985 when the effects of polypharmacy finally caught up with him. Colin moved into campaigning on the issue of benzodiazepines and other prescribed mind altering nostrums. He quickly discovered that health provision was about politics primarily and not health benefit, which was a side-effect if it occurred. Colin felt this message should be disseminated as widely as possible and I do this through images and print. But an image in the right place is worth a million words." "Doctoring the Mind: Why Psychiatric Treatments Fail" by Richard P. Bentall "…Bentall’s thesis is that, for all the apparent advances in understanding psychiatric disorders, psychiatric treatment has done little to improve human welfare, because the scientific research which has led to the favouring of mind-altering drugs is, as he puts it, “fatally flawed”. He cites some startling evidence from the World Health Organisation that suggests patients suffering psychotic episodes in developing countries recover “better” than those from the industrialised world and the aim of the book is broadly to suggest why this might be so." The Guardian - June 22 2009. Mad In America, by Robert Whitaker "Why should living in a country with rich resources, and with advanced medical treatments for disorders of every kind, be so toxic to those who are severely mentally ill?" This is not a rhetorical question, but one that demands an answer. "The Feeling Good Handbook" by David D. Burns M.D. "This is a very well written and insightful book on how to naturally handle a lot of the issues that come up in our lives without having to resort to drugs to deal with them."